Over the years, the story of King Arthur has inspired many film interpretations from the glory of John Boorman’s Excalibur to the inept mess of Guy Ritchie’s King Arthur: Legend of the Sword. It’s safe to say that after Ritchie’s dismal Arthurian failure, no one was clamoring for another return to Camelot in 2019. Still, somehow, we got one, and the good news is that, as you might tell from the title, The Kid Who Would Be King isn’t just another tired rehashing of old legends. Instead, what director Joe Cornish delivers is a modern-day update with a 12-year-old successor to Arthur. While Cornish deserves praise for his efforts, the finished project is too often stuck in the limbo between kids’ film and entertainment for adults. Lest anyone forget, according to legend, Arthur was a lad of 15 when he pulled Excalibur from the stone, so it’s not that great a stretch to put that sword in the hands of a 12-year-old. The title character of The Boy Who Would Be King is Alex Elliot (Louis Ashbourne Serkis), an extremely ordinary middle-school student whose only connection to the Arthurian legend is an illustrated book about the Knights of the Round Table that Alex’s father gave him shortly before running out on his family. Alex is a decent enough sort, which gets him in trouble when he tries to intervene to help his best friend Bedders (Dean Chaumoo), who is being humiliated by the school bullies, Lance (Tom Taylor) and Kaye (Rhianna Doris). Alex’s attempt at chivalry turns the bullies against him and, after school, they chase him to an abandoned constructions site where he finds Excalibur buried in a hunk of concrete and pulls it out. Alex shows Bedders his find, unaware that removing the sword has set several supernatural events in motion. First, Arthur’s sister Morgana (Rebecca Ferguson) wakes from the underground lair where she had been imprisoned for centuries, and, second, a very young-looking Merlin (Angus Imrie) shows up to help Alex. Merlin explains to Alex that Morgana is going to reappear and attempt to take over the world (or something like that) during the solar eclipse that’s going to take place in four days, and that it’s up to Alex to stop her. 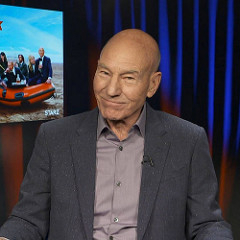 Alex is somewhat hesitant until Merlin reappears as an old man (played by Patrick Stewart) and shows the boy a vision of a disastrous England if Morgana gets her way. Alex finally agrees to go to a remote part of the country to do battle with Morgana. Along with Bedders, Alex persuades Lance and Kay to accompany him as well, telling them that they will be his new Knights of the Round Table. The Kid Who Would Be King bears several similarities to Joe Cornish’s first directorial effort, Attack the Block. In that film, another group of unlikely heroes (primarily members of a street gang) did battle with aliens in a mix of comedy and horror that worked quite well. That same formula isn’t nearly as effective here. For starters, the idea of four middle schoolers going off to do medieval battle against demonic forces just doesn’t work. The clip below shows the kids preparing for battle, and they seem more like Christopher Robin and friends going off to fight the Heffalump than the spiritual descendants of the Knights of the Round Table. The only way that Alex and friends would stand any sort of chance against demonic forces of evil would be for those forces to be somewhat less than all-powerful, and that’s just how Cornish structures his film. Morgana herself is mostly missing from the movie, indicating that Rebecca Ferguson only signed up for a minimal shooting schedule (and, frankly, her entire role is an enormous waste of her talent). To make up for her absence, the film provides her with lots of flunkies, demonic knights that resemble the Ghost Riders in the Sky. These knights look scary enough, but they prove ridiculously easy to destroy, shattering into pieces at the slightest contact. Plus, as the movie goes on, the encounters between kids and knights grow exceedingly tiresome, as it soon becomes apparent that these PG-rated demonic knights are actually the least menacing screen villains since the days of Wile E. Coyote. 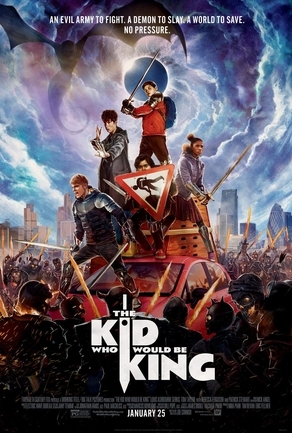 The Kid Who Would Be King would have been a far better movie if the filmmakers had ditched the supernatural elements entirely and concentrated on the core group of actors. The lead quartet prove quite likable and charismatic. Most noteworthy is Louis Ashbourne Serkis, son of Andy Serkis, and Rhianna Doris, whose Kay displays some fantastic driving skills in one of the few action scenes that really work well. In that sequence, she commandeers a car and moves through the deserted streets of London with ease despite several demonic knights on horseback pursuing her and the other kids in the car. The only bit of supernatural gimmickry that really works in the movie is the appearance of Merlin. For reasons that are never entirely clear, his powers are limited, and he transforms between the young Imrie, the not-so-young Stewart, and an owl with regularity. But he summons his powers by playing a bizarre game of rock, paper, scissors with himself (see clip below) that impresses as much for his dexterity than for any magical results. The character of Merlin and the occasional appearances of the Lady in the Lake (seen as an arm rising out of any body of water, including a bathtub), who stashes Excalibur away when needed, are the only bits and pieces of the Arthurian legend that really work in the present-day setting. In my view, the filmmakers made a major mistake in developing their storyline. The monotonous succession of less-than-special effects and the combination of the too-seldom-seen Morgana and the too-often-seen demonic henchmen of hers resulted in a film that’s a good 20 minutes too long. On the other hand, the cast of juvenile actors is quite good and play off each other quite well. I would have really enjoyed seeing young Alex on a quest against a more credible (and more worldly) set of villains. Surely, modern-day London has a supply of human thugs for the Knights of the Round Table to vanquish. I can’t quite recommend The Kid Who Would Be King. The film has likable, entertaining leads and a good message for youngsters about the importance of having the right values, but it buries that message almost as deep as Morgana’s tomb. Instead, the movie is overstuffed with mediocre special effects and ultimately somewhat boring. The legend of King Arthur is still alive, but films like this don’t advance it very much. In this clip, the new Knights of the Round Table begin their training under Merlin's tutelage.